BAYSWATER council has rejected stage 2 of the “aspirational” Bayswater to Morley Bike Boulevard project, following opposition from a group of Bedford residents. The boulevard project is funded and led by the Department of Transport and is part of the Safe Active Streets Pilot Program. 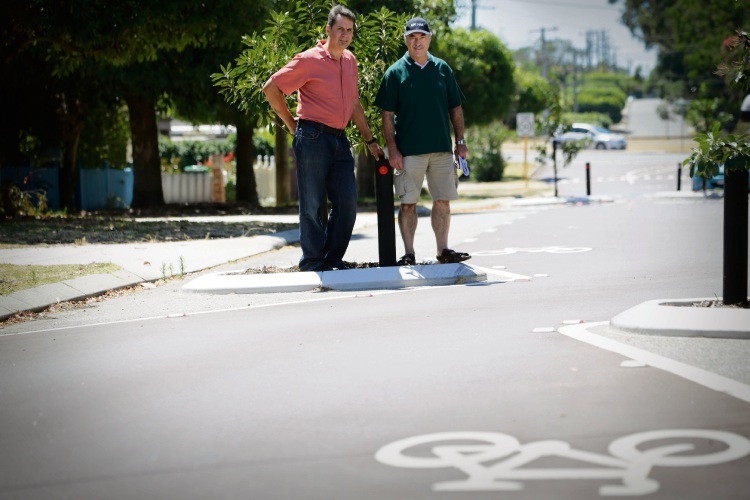 In 2015, the Department and City of Bayswater started work on the bike boulevard to help fill the need for a local bike route that connects the Swan River foreshore and Morley Town Centre, as identified in the City’s Bike Network Plan. The Department funded $1 million for stage 1 of the project, which runs along Leake Street and May Street and opened in September 2017. Deputy Mayor Chris Cornish, Crs Barry McKenna, Elli Petersen-Pik and Giorgia Johnson voted against. Edward Street property owner Len Katich said he spoke to more than 20 adjoining residents who were concerned about safety for all users, poor signage, single lane and pinch points which increased the risk of accidents. Fellow property owner Tony Freeman said he was “surprised” with the outcome but disappointed with the Department not supplying the Road Safety Audit and peer review of stage 1 along with the lack of public consultation. Tony Sorgiovanni, whose father lived on Edward Street, said most cyclists would either push their bikes up the hill on Edward Street or use Beaufort Street and Coode Street to get to Morley instead. “If you were going to spend money on improving cycling infrastructure to extend the Bayswater Railway Parade Cycleway to Morley, surely you would think that Coode Street is the logical route,” he said. Cr Fleeton, who was unsupportive of stage 1, said while stage 1 would be partially wasted as the following stages were not being continued, it was a mistake to proceed further. “It does not provide benefit over and above what these people are losing out on in their daily lives; I sure as hell don’t want to live on a street like this,” he said. “Why would you advocate for this vacuum set of rules on a road to just be a once-off and everywhere you go, there will be a separate context and rules – it makes no sense to making motorists and cyclists learning to use the road safely with pedestrians. Mayor Dan Bull said he learnt how to use the boulevard on Leake Street and found it did not have a downward impact on road safety. “What has gone in there, I believe, has not done what I believe it should do, which is to make a safe environment for bikes and pedestrians and also other car users as well because that is primarily what is confusing,” he said. Cr Johnson, whose motion to approve stage 2 with consultation around Chisholm and the proposed crossing on Beaufort Street was lost, said although there was a lot of objection for stage 1 at the start, people became appreciative of the trees and slower traffic. A Department spokeswoman said it would be meeting with the City in the following days to determine the next steps and the community would be informed of any developments. “Representatives from both the Department and the City have attended all engagements and have been actively involved in discussions with residents and community members in order to gain a comprehensive understanding of their comments, concerns and suggestions,” she said. She said the funding could only be used for the development of safe active street initiatives such as bike boulevards.